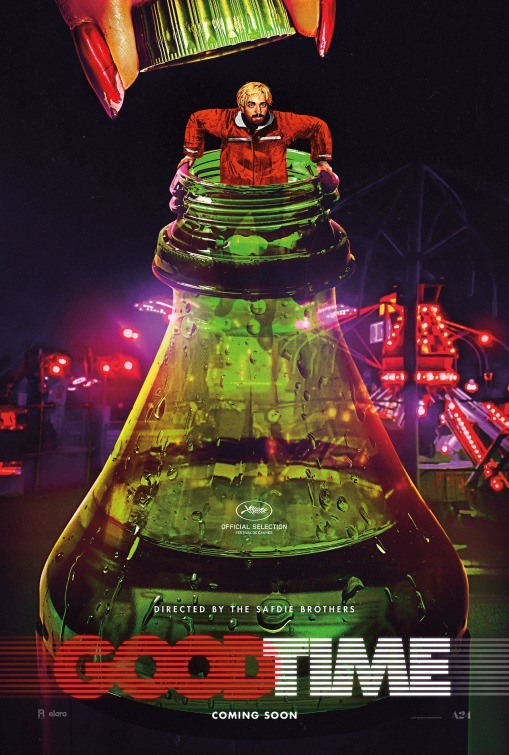 The title of Good Time is both ironic and apt. It is honest in that Good Time is such a good film that you will have a good time watching it. But the irony comes in that the story itself is anything but a good time for the characters it follows. Indie film makers, the Safdie Brothers have broken through to the mainstream with this beautifully shot, powerful film about desperation and the love between brothers. It is a tragedy, a heroin like nightmare of a man's downfall, a man already on his knees, and it is a thing of unsightly beauty. The Safdies have taken a tight, satisfying story, shot it through the eyes of a man on the edge, and manage to find quiet, lovely moments on the road to hell. At the centre of this is Robert Pattinson, still determined to distance himself from any resemblance to Edward Cullen, giving a performance that knocks it out of the park. He is an exploiter, a criminal, yet we follow his misguided attempts to help his brother, the one thing he takes responsibility for. He makes everything worse for his brother and for himself. It is his Achilles Heel, if someone this broken can have an Achilles Heel. The Sadie Brothers have shown an adept power in their ability to tell a story effectively, while imbuing a sense of empathy despite all that we are witnessing. They have found their subject in the garbage and help us to see his humanity, despite his own doings. They have also shown a truly beautiful eye for making movies. I couldn't take my eyes of Good Time. Despite a lot of what I was seeing, I wanted to keep seeing it. Their flared late night NYC is a stunningly gorgeous thing, warts and all. Good Time is a great movie, and makes the Safdie Brothers ones to watch.